This entry was posted on Sunday, March 25th, 2012 at 10:27 pm and is filed under Interests, old photos, Old Things, On-Line Resources, Random Historical Info. You can follow any responses to this entry through the RSS 2.0 feed. You can leave a response, or trackback from your own site. There was another quarry nearby where 101 crosses the Mad River now which produced 2,000 tons of granite for St. George Lighthouse at Seal Rock off Crescent City in 1884. Amazing that no trace remains today of so much of historical activity. Of course, Isaac’s quarry is still there, but the amount of poison oak to get there is daunting. It reputably never produced much material. A friend used to take his Scout troop there regularly and built some cabins to stay in for weekend campouts; they’d get there from Fickle Hill Rd. There’s still evidence of the railroad that zigzaged up to the quarry from West End Rd. but is on a private ranch, which also has a short section of what might be the last remnant of the 3′ redwood water line that used to supply water to Arcata/Eureka from the defunct Sweazey (spelling?) Dam. Wood from that water pipe lines the walls of the Eureka City Hall. Crabbers loved the iron rings for making crab pots. This is great info, Bob. Thanks. If you have, or can track down any more recent photos, please send ’em my way and I’ll post them. If I ever coerce Dan Trump into leading me down to Minor’s quarry from Fickle Hill Rd. I’ll send you pictures. I know that coming from below is daunting because of the vast amounts of poison oak. I was at the McKinleyville Land trust fundraiser last night and sat next to a woman who lives at the top of St. Maru Drive. We discussed the (once)quarry there that the St. Georges Reef Lighthouse was built from. She could well be living right on top of it but was not aware. She’s going to contact me if she learns more and invite a peek at whatever remains. I’d whine to encourage you to go and get photos, but sounds like you have to wait for an invite. I’d love to post photos if you ever get ’em…. there is a creek called Quarry Creek that descends down to what is now called Hatchery Road near West End Road (to distinguish it from Old Fish Hatchery Road). one can get to the top of the watershed on a logging road that meets Fickle Hill Road near mile post 3.5. going down hill from Fickle Hill, i once followed a skid road on the South side of the logging road to a borrow pit near Granite Butte, but didn’t know to poke around for artifacts or a railroad. But I wonder if that ‘well-dressed man’ was Isaac Minor himself– and these pictures were taken on January 18, 1908? I do suspect that it is him. Just a feeling though I have nothing to support it. I also suspect it is him as did a number of my relatives when they contributed to the article “The four Minor brothers”, Humboldt Historian, Vol. 37, No. 2, May-June 1989. I’ve enlarged the figure in this photo and compared it to a family portrait of my great-great grandfather and it is almost certainly Isaac himself. I find that the St. Maru street quarry was moving rounded blocks that were spilling down the hillside, down to a dressing area, then onto rail road cars, which were then loaded several at a time onto a barge in the bay, towed across to a point on the north Humboldt Spit where sheds and housing were built for a crew of men to finish dress the stones and put them on steamers for shipment to St. George reef. The initial cost to set all this up was $100,000 in the end of the 1800s. There were stub railways built and all sorts of details; I wonder if any of *that* shows today or not? Apparently the government didn’t fund for a few years due to a recession and the original pier rotted off, but new one was built. During the unfunding all the blocks got washed off the hillside to the bottom by the rains and had to be re-excavated from the mud at the bottom of the hill. The rock is variously described as granite, but then also called “dark” which is unusual. They took all the cuttings, gravel etc. for fill inside the lighthouse, so if there’s any left at all out there, it won’t be big obvious pieces, the large blocks having slid downhill and buried the rail stub over 130 years ago. They dug out the rail stub and reused it too for the remainder of the project. I am always amazed at how much dirt our ancestors moved around with simple machines and hand labor. Oh yes. I fear we couldn’t do the same today if we lost all our equipment. Thanks for this–and giving us more structural/concrete “ghosts” to watch for. 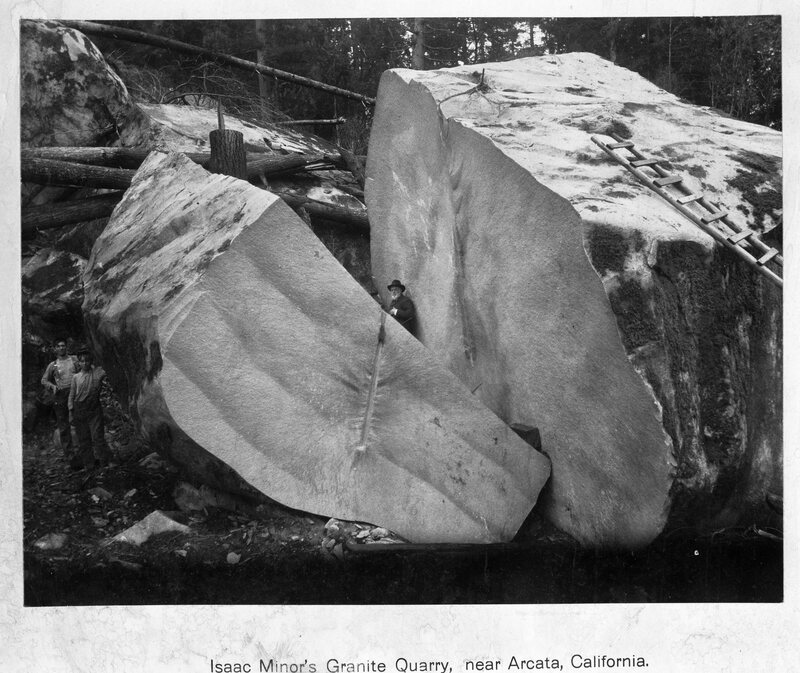 If we ever travel up to your part of California, I’d love to try to locate and photograph the old quarry if there’s a way to get there without going through the poison oak. I agree w/ Peggy, I would love to try to find the old quarry, is it located on private land now? When I first heard about the St George light house my first thought was that they resourced the stone from the quarries near Madera because I did not know there was granite in the Arcada area. You can see the site of the St. George Quarry from 101… just before you get to the new bridge on 101, near the giant flag, look up and towards McKinleyville… There is a steep bluff with a house on the top. That’s where the St. George Quarry was, on St. Maru street. Nothing shows as “surface workings” because the granite was in giant boulders, they didn’t create the traditional high wall, but split the boulders into blocks and rubble, sent them down that steep incline to the waiting train cars where they went to Mad River Slough, straight across to where Vance’s first mill was on the river. Then they were towed behind a boat all the way to Samoa… etc. The waiting train cars were on a trestle for quite some way. Vance took the whole pile out when it was no longer needed and repurposed it all to run rails up and into redwood holdings to bring the timber out to his newer mill down toward the mouth of the slough where there is still a mill. The rail line is described and mapped in Stanley Borden, Eureka and Oregon Railroad. I got my copy from Ebay, they still had several left. PS, you can collect granite shards from the process at the workings yard at the Boat Ramp just north of the Humboldt Bay Lifesaving Station on the Samoa Peninsula. That’s where the stones were finally dressed and shipped to St. George and at low tide, all those funny looking sharp edged rocks at the boat ramp are granite! There are tool-marked granite chunks in the shrubs along St. Maru, but the homeowners have had to deal with so many transients, they’re a bit uptight when people go poking around up there. In a post by Bob Felter in April of 2012 he mentions “A friend used to take his Scout troop there regularly and built some cabins to stay in for weekend campouts”. As a member of a Boy Scout troop in Arcata that met in the basement of the Legion Hall we went on several campouts in the late 1950’s or early 60’s. Scout leader was Marino Sicchi. One of our campouts was to “Minors Quarry” and stayed in some very rundown cabins on the side of a hill. I can’t remember where the site was but would like to visit the site again. Can anybody help with where this might have been near Arcata? See my post above from Sept 23rd for rough directions. Next time I’m there I’ll poke around more carefully for artifacts. I’d be willing to take you there. It’s only a few miles from the County road.